PALMETTO, Fla. (October 24, 2013) – Andersen Promotions, which will operate all levels of the Mazda Road to Indy next year, today unveiled the 2014 schedule of events for the three series comprising the ladder system – Indy Lights Presented by Cooper Tires, Pro Mazda Championship Presented by Cooper Tires and Cooper Tires USF2000 Championship Powered by Mazda. For the first time since the inception of the Mazda Road to Indy as the official development series of INDYCAR in 2010, all races on next season’s calendar will be run in support of the IndyCar Series. 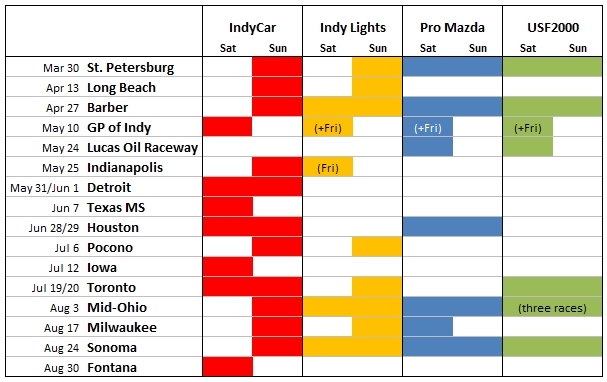 Additional schedule highlights include doubleheader rounds for Indy Lights at all permanent road courses with a “sprint” race on Saturday of 40 minutes and a “feature” race on Sunday of 60 minutes just prior to the IndyCar Series main event. Pro Mazda will feature standing starts at all street circuits and USF2000 will once again host a tripleheader round. All Indy Lights races will feature same-day coverage on the NBC Sports Network with international rights held by ESPN International. Pro Mazda and USF2000 will also be featured on the NBC Sports Network with a minimum of four highlight shows, which will also be broadcast on Motors TV in Europe. The Mazda Road to Indy will open its 2014 season on the Streets of St. Petersburg, Fla., on March 29/30. Indy Lights will then head west two weeks later to the Streets of Long Beach, Calif., on April 13. On April 26/27, the three series will reunite at Barber Motorsports Park in Birmingham, Ala., for doubleheader rounds on the permanent road course. The month of May will be centered around the Indianapolis 500. Two rounds each of Indy Lights, Pro Mazda and USF2000 will take place in support of the inaugural road course race at the Indianapolis Motor Speedway, the Grand Prix of Indianapolis, on May 9/10. In keeping with tradition, Indy Lights will contest the Freedom 100 race on May 23 – Carburetion Day at the Speedway – while Pro Mazda and USF2000 will compete under the lights at the “Night Before the 500” on May 24 at nearby Lucas Oil Raceway at Indianapolis. Pro Mazda will be the sole Mazda Road to Indy act in support of INDYCAR on the streets of Houston on June 28/29, while Indy Lights will hold its second oval event on July 6 at Pocono Raceway in Long Pond, Pa., and will be joined by USF2000 on the streets of Toronto, Ontario, Canada on July 19/20. August will feature a flurry of activity for all three levels beginning with the Mid-Ohio Sports Car Course in Lexington, Ohio, on August 2/3, which will include doubleheader rounds for Indy Lights and Pro Mazda and a USF2000 tripleheader. Indy Lights and Pro Mazda will contest their final oval events of the year at The Milwaukee Mile in West Allis, Wis., on August 16/17 before the season finale for all three series at Sonoma Raceway in Sonoma, Calif., on August 23/24. The unparalleled Mazda Road to Indy Summit program will take place during the St. Petersburg and Indianapolis weekends. Providing the off-track tools drivers need in their professional motorsports careers, this year’s curriculum included courses in conducting interviews, the business of motorsports, performance thinking, fitness and wellness, driver brand building, social media, the intricacies of oval racing, working with the media, maximizing simulators and providing return on investment. Additional Summit activities include networking receptions, IndyCar Series team shop tours and Q&A sessions, high-profile autograph sessions and INDYCAR Fan Village participation. The Summit program also provides opportunities surrounding the Indianapolis 500. The series point leaders in Pro Mazda and USF2000 in May are given the opportunity to pace the Freedom 100 Indy Lights race on Carburetion Day, and the winners of the Freedom 100 and “Night Before the 500” races are introduced and interviewed in front of the Indy 500 crowd minutes before the start of the race. The Mazda Road to Indy provides a scholarship package at each level for drivers to advance to the next step on the ladder. Recently crowned Indy Lights champion Sage Karam, 18, will receive up to $1 million in prizes and awards to aid his ascent to the IndyCar Series. Karam was the 2010 USF2000 champion and finished third in Pro Mazda last year. Matthew Brabham, 19, secured over $636,000 as the 2013 Pro Mazda champion and will advance to Indy Lights next season with Andretti Autosport. Brabham, the 2012 USF2000 champion, is the first driver to advance through all levels of the Mazda Road to Indy in succession. After contesting a partial season last year, Scott Hargrove, 18, secured this year’s USF2000 title and scholarship package of over $383,000 to advance to Pro Mazda in 2014. This is great news. Andersen is an amazing supporter of open wheel racing. His kart track in Palmetto is fantastic, if you’re down for the St. Pete race check it out. Great rental karts and racing.